Francesco Raibolini (c. 1450-1517), called Francia, was an Bolognese painter, goldsmith, and medalist. He was first mentioned as a painter in 1486 and his earliest known work is the Felicini Madonna, which is signed and dated 1494. 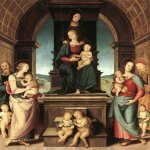 He worked in partnership with Lorenzo Costa, and was influenced by Costa's style, until 1506, when Francia became a court painter in Mantua, after which time he was influenced more by Perugino and Raphael. Raphael's Santa Cecilia is supposed to have produced such a feeling of inferiority in Francia that it caused him to die of depression.